How to cite BILBY data ? The BILBY array [Rawlinson, 2008] consists of 25 broadband seismic stations (Guralp 3ESP sensors) deployed between August 2008 and February 2011 along a North-South transect extending over 1000 km across central Australia (red squares on the map). 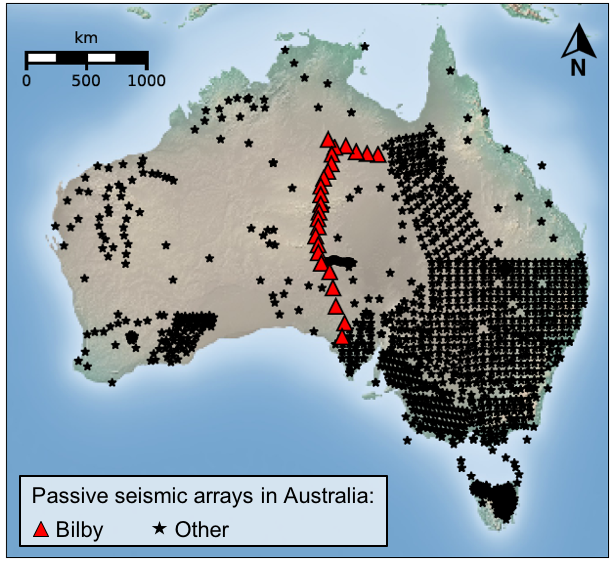 BILBY was designed to investigate the transition in the lithosphere between the northern and southern Australian cratons and across parts of the intercratonic suture belts. BILBY connects the Gawler Craton in the south to the Mt. Isa Block in the north through the Musgrave and Arunta Blocks. An analysis of the seismic data aquired with BILBY showed three distinct Moho discontinuities in this complex region, the northernmost of which was previously unknown [Sippl, 2016]. Sippl Christian, 2016, Moho geometry along a north–south passive seismic transect through Central Australia. Tectonophysics, 676: 56-69.